Hey, there! 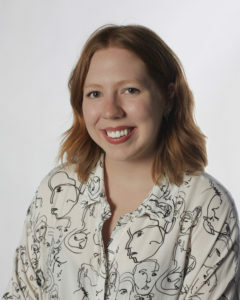 I’m Katie, the editor-in-chief of Thread. 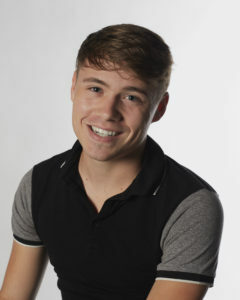 I’m currently a senior, wondering how my years working with the magazine have flown by so quickly. 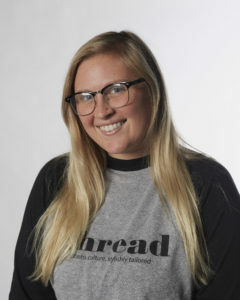 I joined as an editorial assistant my junior year of high school, and this will be my sixth year working with Thread. I’ve been lucky enough to watch the publication blossom into what it is today, both online and in print. I’m studying journalism news and information and Spanish, and I love to travel. I spent this last summer living in NYC working for O, The Oprah Magazine and consuming as much fashion as possible. On campus, you’ll probably catch me clad in a denim jacket and sipping a Donkey coffee. Always feel free to say hi if you see me around! 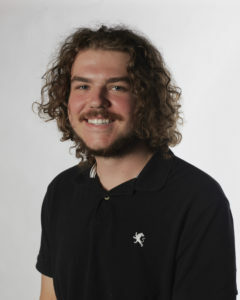 Hello, my name is Matthew Jones and I’m a junior majoring in commercial photography. I’m the current Photo Chief at Thread Magazine. I stop by all the shoots to help assist or digital tech throughout the shoot. Feel free to ask for help with lighting or working in the studio, class assignments or personal assignments! I’ll lend a hand as long as my schedule allows it. When I’m not taking pictures, I’m probably hiking at Strouds Run, biking along the bike trail or at home watching Brooklyn Nine-Nine. 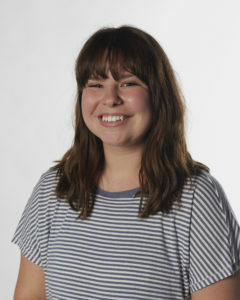 Hi, my name is Rylie Brown and I am Thread’s Managing Editor this year! I am a senior studying Strategic Communication, complementing my involvement in 1804 Communication and my work at The Post. When I’m not busy scheduling social media posts, brainstorming creative ad campaigns, or doing homework, I enjoy using my down time listening to music, watching Netflix or drinking ridiculous amounts of coffee. Hi there! 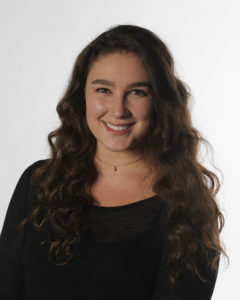 My name is Maggie (often referred to by friends as Marge, Margie, Madge, or Mags) and I’m this year’s Fashion Director. I love everything there is to love about style, fashion, self-expression, art, and color. Originally from the beautifully liberal town of Shaker Heights, Ohio, I’ve spent the last two summers in New York City working fashion and editorial internships with some great companies. I’m a big music freak and huge fan of classic rock. If you love peanut butter, The Grateful Dead, or have an abnormally large amount of shoes in your closet, we should be friends! Hi! My name is Leanna and I am a sophomore majoring in Commercial Photography with a minor in Marketing and certificates in both Social Media and Entrepreneurship. 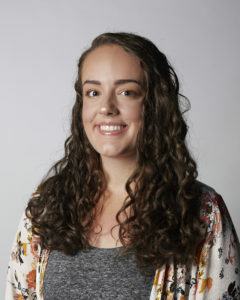 I am the photo editor for Thread and I also work as the photographer for all thirteen departments of the Division of Student Affairs, am an ambassador for the School of Visual Communications, and help run the gallery in Schoonover. You’ll probably see me at some point running around campus decked out in the color pink or in the dining hall going up for my second serving of pasta, so please feel free to say hello! I am a senior majoring in Information Design: Publication and Infographics with a specialization in journalism. This is my second year being Design Director for Thread. 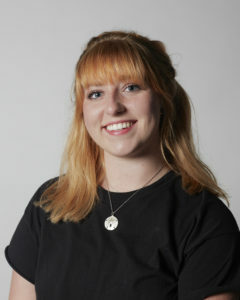 I am also a graphic designer for OHIO Campus Recreation, Vice President of Ohio University Multimedia Society, and a Visual Communications student ambassador. On top of all of that, being a part of the Club Lacrosse team helps add variety to my busy life. In my free time I enjoy collecting local art, keeping up with what’s happening in pop culture, and writing my blog. You can catch me around campus looking through Rolling Stone or W magazine while listening to alternative music from any decade. Hello! 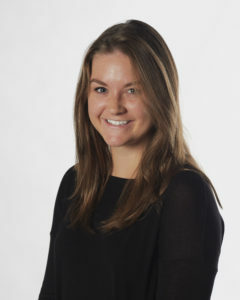 My name is Baylee Gorham, and I’m the video chief for Thread. I’m a senior studying media production with a love for cinematography. I have a passion for travel and visual storytelling that has lead me everywhere from Los Angeles to Ireland to pursue my dreams. When I’m not behind a camera, you can find me playing rugby, drinking copious amounts of tea, or rewatching Lost. Hello! 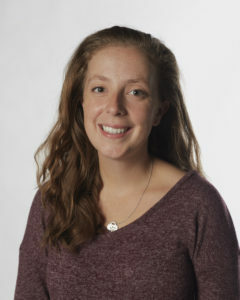 My name is Colleen, and I’m the features editor for Thread. This is my second year working for Thread as a writer and I’m thrilled to join the executive board for my final year with the magazine. My hope for this year is to make the features section of the magazine more in-depth and hard hitting than ever before. I’m a senior studying journalism with a minor in marketing. When I’m not studying you can find me watching The Office, spending time with pals, and or reading various publications or novels. If you see me around campus, say hi! Hi! 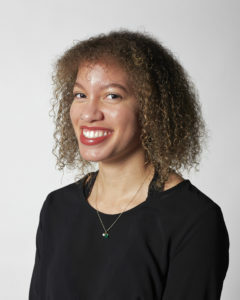 My name is Courtney and I am the DIY Editor for Thread. I am in my senior year of studying retail merchandising and fashion product development. For a girl that loves Pinterest, crafts and writing. this is the perfect position to have. 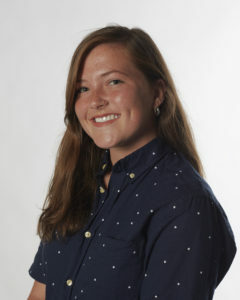 A few of my favorite things on this world are traveling, fashion/clothes and people watching on Court St.
Hey I’m Hannah and I’m the Seams editor for Thread. I’m a sophomore majoring in Journalism Strategic Communications and this is my first year as editor; I’m definitely enjoying it! I’m a big fan of Parisian culture and fashion and hope to travel to Paris one day in the near future. I plan to work in the fashion industry after graduating, hopefully for a magazine, in a big city far away from rural Ohio, which is where I’ve spent my entire life. I love minimalistic looks and religiously follow Coco Chanel’s life code of taking one accessory off before leaving the house. Hello! I’m Grace, the web editor for the magazine. I’m a current senior, majoring in Information/Multimedia Design with a minor in Marketing and a certificate in Social Media. I am also the President of the Ohio University Multimedia Society (OUMS). I enjoy my busy schedule because it constantly challenges me, and I have been able to grow as a student and a young professional. I plan to head to New York City next fall working at an advertising agency. I believe that the only way one can stay motivated to achieve something great is through hard work and a positive mindset. Hello! 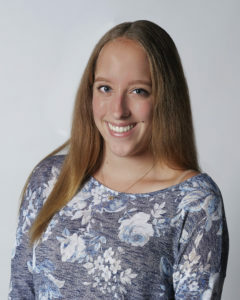 My name is Leah Nutter and I am a senior double majoring in Integrated Media and Spanish with a minor in Marketing and a certificate in Social Media Studies. If I’m not on a film set you can probably find me hanging out on college green or budgeting my next film on an excel spreadsheet. This is my second year in Thread and besides being the business manager; I work a lot with the Thread video team creating promos for the magazine.